Imagine if a former MTV executive tried to make wine in Napa Valley, based in part on his research into millennials’ tastes. What would he come up with? Extra points for those who guessed old-fashioned wines like the greatest Napa Cabs of the ’60s: lower in alcohol, more savory than sweet. The label is called Ashes & Diamonds, named after a 1958 Polish movie. Though his family is in the wine business, Khaledi has spent the entirety of his previous career in music, starting as a music editor for Hustler and then working for record labels before MTV. He is going about the wine business like a music producer: lining up artists and letting them work. This wine super group, though, is no lame pop band. 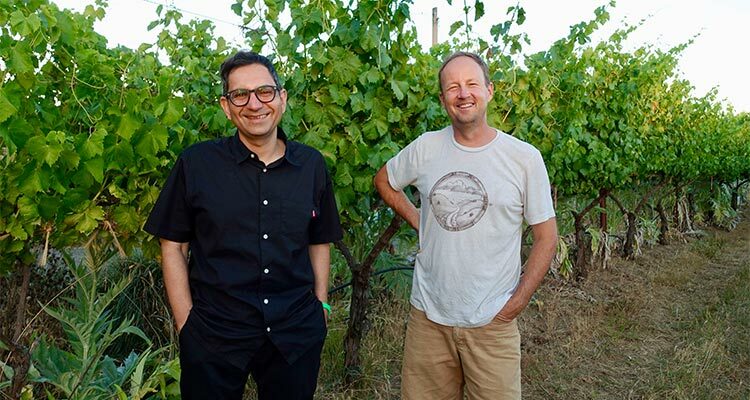 Instead, they are Napa’s equivalent of low-fi postpunks, starring two winemakers: Steve Matthiasson (pictured above with Khaledi), well-known to fans of restraint in Napa; and Diana Snowden-Seysses, who spends her time between a family estate near Rutherford and Burgundy’s Domaine Dujac (which her husband runs). In the beginning, Khaledi also worked with Dan Petroski, until the latter’s own Massican wines required more of his attention. For 2017, most of the 6000 Ashes & Diamonds cases will be made from purchased fruit, with the guiding hand of Matthiasson, whose day job when he’s not making wine (or thrashing to “Rise Above”) is working as a vineyard consultant. 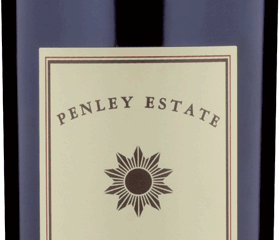 The most exciting Ashes & Diamonds wine I try is a 2015 Cabernet Sauvignon barrel sample from Andy Beckstoffer’s Georges III Vineyard in Rutherford. 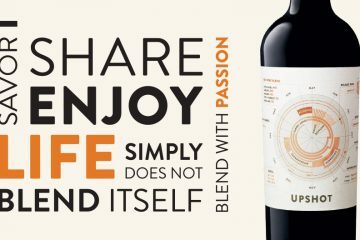 Dubbed “Vineyard 1” on the label to avoid Beckstoffer’s pricing demands for wines that use his vineyard’s names, it smells like Cab Sauv, has good freshness, and while it has a deep, dark fruit aroma, is complex but not overpowering on the palate. According to Matthiasson, it has 12.3% alcohol, which if printed on the label would be the lowest alcohol I have seen on a Napa Cabernet in many years. 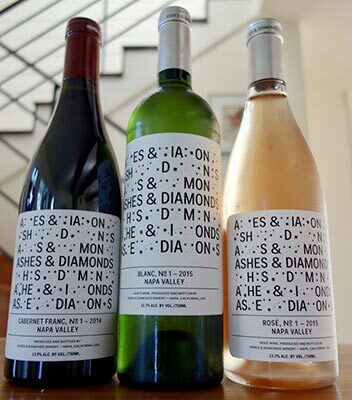 Ashes & Diamonds is making 11 different wines, which is like a band releasing 11 different albums (remember those?) — some will resonate more than others. And they’re not cheap: Khaledi anticipates his prices to range from $25 to $125. He expects to open a tasting room later this summer, though, and his Napa Valley neighbors sell their wines for more.